The formidable SET’Z restarant located in the Emporio Mall has made a name for itself amongst the best in the business. With seven kitchens going strong, they now have a new feather in their cap—Iranian Cuisine. To helm the new menu the group has brought in Chef Feridoun Sohrabi Shahsavar. 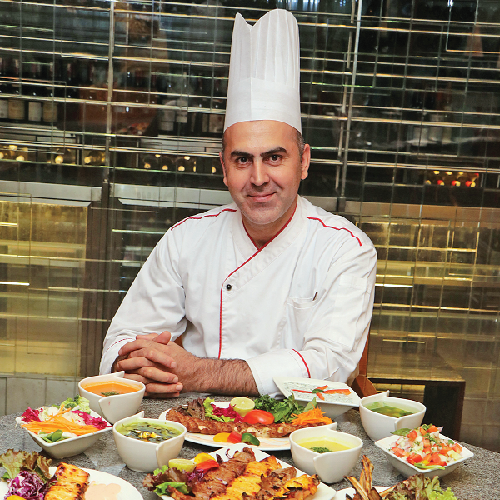 With more than two decades of a vast and versatile culinary repertoire, Feridoun Sohrabi Shahsavar set foot in the hospitality industry as a chef with the Abshariranian restaurant in Dubai. A master of Iranian cuisine, he brought his homegrown passion for cultivating traditional flavours of Iran, blended with a modern day twist, taking his guests on a culinary joy ride. Feridoun’s developing passion for food was heightened during his many years of living across the Middle East. He took every passing opportunity to learn as much as he could through culinary classes, interacting with fellow chefs and exploring the many different flavors every city had to offer. Having worked across leading hotels such as the Shahriyar Hotel (Iran), Hyatt Regency (Dubai), Emirates Palace (Abu Dhabi), and The President’s Palace (Qatar), Feridoun’s immense experiences have enabled him to refine the culinary art and bring his cultural authenticity to the table. Along with the creative aspects, his year-and-a-half stint with the Hatam International Restaurant in Thailand enabled him to supervise operational technicalities such as pre-opening and training of the staff, menu planning, and innovating with old world Iranian ingredients and local flavours. Iranian delicacies are definitely worth a try and this tops the list as far as authentic cuisine goes, so check it out.